What is detonation? Detonation in spark-ignition internal combustion engines occurs when combustion of the air/fuel mixture in the cylinder starts off correctly in response to ignition by the spark plug, but one or more pockets of air/fuel mixture explode outside the envelope of the normal combustion front. The fuel-air charge is meant to be ignited by the spark plug only, and at a precise time in the piston's stroke cycle. The peak of the combustion process no longer occurs at the optimum moment for the four-stroke cycle. The shock wave creates the characteristic metallic "pinging" sound, and cylinder pressure increases dramatically. Effects of engine knocking range from inconsequential to completely destructive. It should not be confused with pre-ignition (or preignition), as they are two separate events. This is how much detonation can damage pistons. 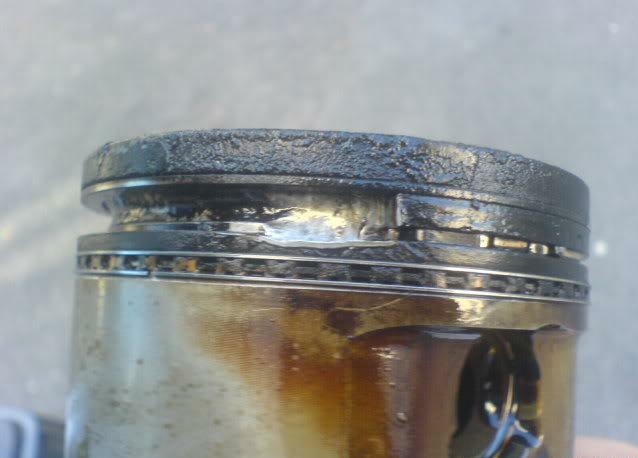 This is one of my old 20v pistons with a broken ring gland caused by detonation. So....guys...please keep your car out of detonation/pinking. All std 20v's keep your ignition timing at 16 degrees max....preferably just under that to be safe. 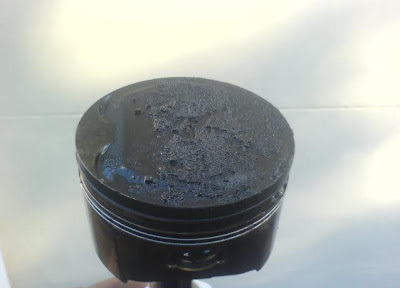 Notice the carbon build up on the piston caused by a blocked injector. The carbon caused an increase in compression in the chamber and thus detonation.